A walk into Regents Hall of Natural and Mathematical Sciences these days might put you in the middle of a playground. A molecular playground, that is. 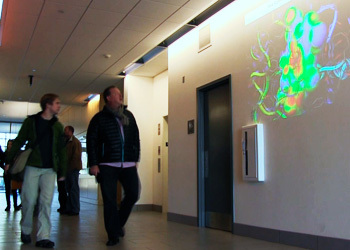 Just inside the building’s main entrance, pedestrians can walk through a hallway where their motion causes a variety of projected molecular structures to spin on the wall and present multiple views. It’s all part of a project created by St. Olaf Professor of Chemistry Robert Hanson and University of Massachusetts, Amherst, professor Craig Martin. "Chemistry is very visual," says Hanson. "If we can get students interacting with this and controlling it," he concludes, "we can give them a much better idea of how the chemistry actually works."